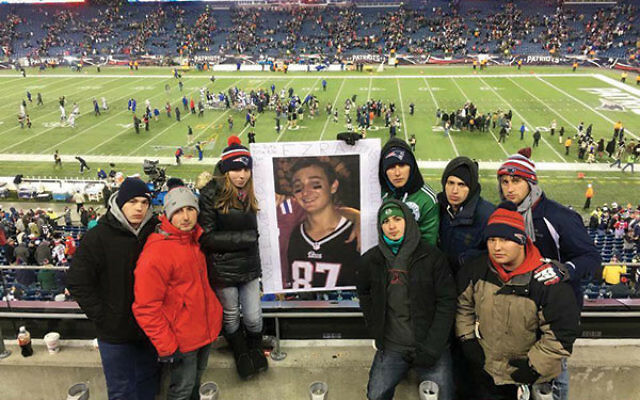 Ezra Schwartz’s friends at a football game between the New England Patriots and the Buffalo Bills just four days after he was murdered. 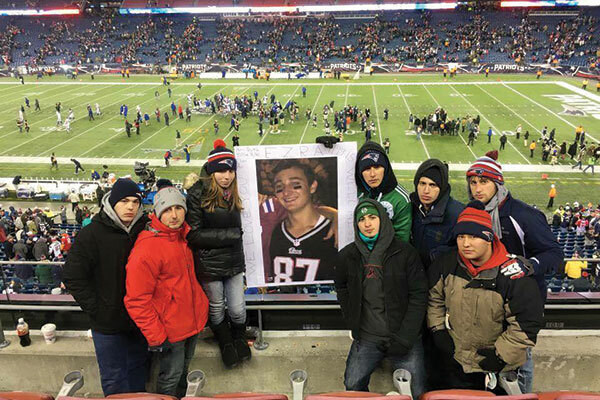 The Patriots held a moment of silence in memory of Ezra, a passionate fan, prior to the game. Last week marked the first anniversary of the murder of Ezra Schwartz, the 18-year-old American who was studying at Yeshivat Ashreinu in Beit Shemesh for his “gap year.” He was on a volunteer mission, en route to beautify Shmurat Oz Vegaon, the nature preserve in Gush Etzion established in memory of three Israeli teenagers (one with dual Israeli-American citizenship) who were kidnapped and murdered in 2014. As Ezra and his fellow volunteers slept in the van, a Palestinian gunman in another vehicle opened fire, killing Ezra and two others. His death shattered his family, crushed his friends, devastated a community, and shocked a nation. The Schwartzes are trying to move forward. Ruth and her husband, Ari, who has relatives in Englewood, have four other children, the oldest a daughter in college, and three younger boys in high school, middle school, and elementary school. Ezra was the second child. Ruth said the kids are doing relatively well. Their daughter is feeling motivated by Ezra’s memory to one day go to medical school, and the boys are able to have fun, even while living with heartache. Somehow a year has passed. A first yahrtzeit marks a unique moment for reflection. This is a common theme of the posts on the Facebook account in Ezra’s memory. “365 days have passed. So I guess that means the worst year of my life is over, but the pain feels as strong as ever. Ezra, I love and miss you so much and honestly just can’t believe it’s been a whole year!” writes one friend; “Well, it has been a year. I can’t believe it. A year since the most horrible day of mine and many others’ life. No, I don’t think the sadness will ever truly pass, nor the pain truly heal,” writes another. The other reason Ezra’s death felt so personal was because it wasn’t the first time I witnessed someone close to me grieving for a friend killed by terrorists in Israel: My older sister, Amy — Ariel’s mother — was a good friend of Alisa Flatow, a victim of the Kfar Darom suicide bus bombing in 1995. I knew Alisa relatively well, as she stayed at my parents’ house several times and I spent Shabboses with her during my frequent visits to Brandeis to see my sister. (Later, I attended Brandeis as well, along with Alisa’s sister, Francine). Alisa had an unforgettable smile. I remember hearing that she was injured in a bombing, learning from local news broadcasts that she was from a town in New Jersey I had never heard of at the time — West Orange — and the moment we were told she would be taken off life support. All these years later, the pain is fresh, even for me, though I was just a tangential part of her life. For a parent it’s unimaginable. He’s not there yet, nor will he ever be. Stephen, a gregarious, cheerful person by nature, choked up momentarily when he remarked that Alisa has now been gone longer than she lived. It’s a point echoed by Ruth, who was similarly tearful. “I feel bad that time is going on without him and all he’s missing,” she said. “When he died, his friends were 18 and he was in Israel. Now his friends are in college.” Ezra would have been a freshman at Rutgers.